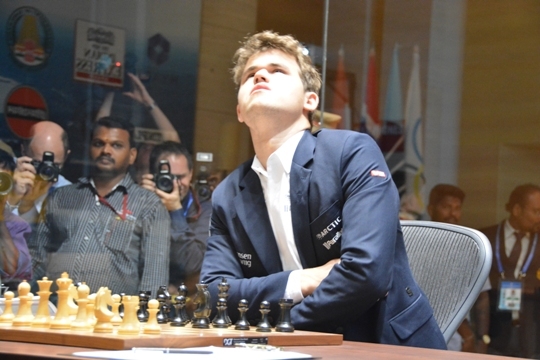 After letting the clock tick for nearly three days, Magnus Carlsen finally made his move. Since becoming the World Champion on Friday, the 22-year old was virtually out of bounds for the media. Even the Norwegian media delegation was disappointed to note the reluctance of their National hero to share his thoughts with them. Carlsen slept long hours, turned out for Team Carlsen in games of football and basketball against the Norwegian journalists but stayed away from interviews. 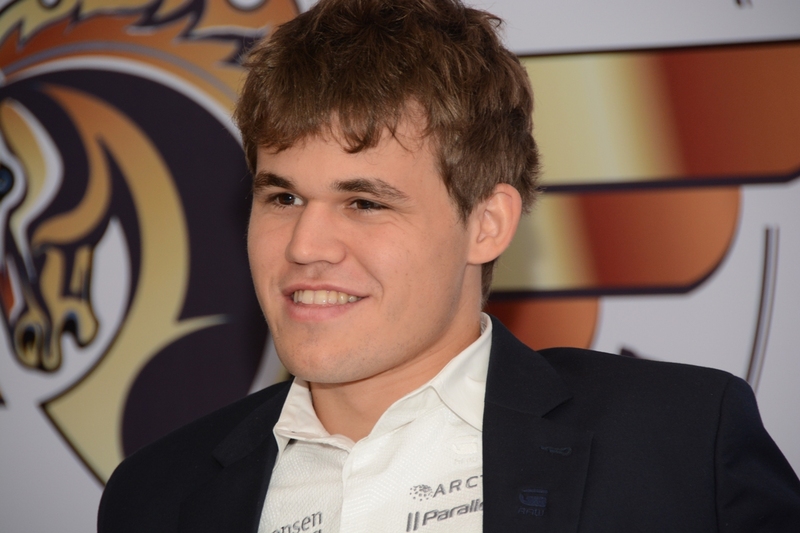 On Monday, soon after this formal ‘coronation’ as the new ‘king’ of the chess world, Carlsen was ready to be quizzed. 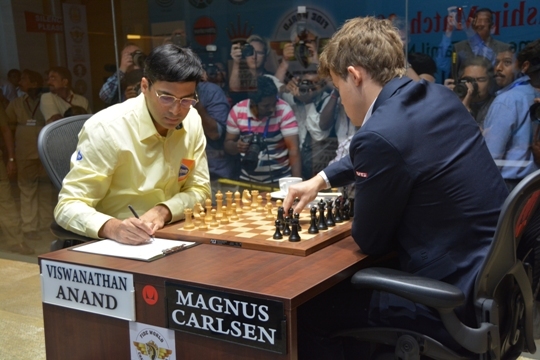 Henrik Carlsen, father of Magnus, chose The Hindu to be the only Indian publication for his son to share his thoughts on the match. 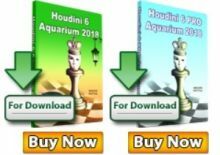 Carlsen settled down to answer a variety of questions ranging on the areas he targeted during the match, why Anand’s “match-experience” was an overrated factor, why his victory was easier than expected, his well-meaning advice to the dethroned champion and much more. Article by Rakesh Rao for The Hindu. An extended version will appear in weekly sports magazine Sportstar. Q: Usually, in the days following the World championship, the winner spends time talking about the triumphs. Why did you stay away from the media? A: A little bit tired, a little bit exhausted from all the events of the last few days. If you found me uncooperative, that’s probably the reason. Q: Coming to your win, did it come easier than you expected? A: It was certainly easier than what I had expected at the start. 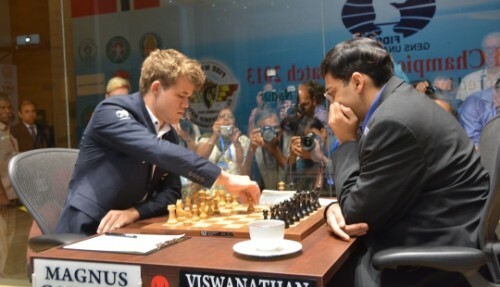 I thought, if I manage to play at my highest level, Anand would not manage to win any games. And I thought that usually I should be able to press him in a number of games and in one or two of them, he should crack. And he did. Q: How did you take it when many thought that Anand’s experience could negate your energy in the match? A: I think at the start it could have mattered since in the first two-three games I was nervous. Perhaps, not ready for the big occasion. And I think, after three games, I had already matured (laughs). I had the ‘feel’ for the championship. I think, match-experience is also a bit over-rated as a factor, because every match has a life of its own. Anand might have played many matches like this before. It doesn’t mean it’s going to be anything similar to this one. Q: Did you plan to target Anand in any specific area of his game? A: Nothing special apart from playing 40 to 50 good moves in every game. That was my main goal. I had to keep playing because I think you’ve worked so hard before the match. You’ve worked so hard to get there. So I think you need to work very hard on the board. If the position is not a draw, you should not agree for a draw. You should play it out. Q: How much time did you spend ahead of each game during the championship? A: I would spend anything from two hours to 10-15 minutes before any game each day. Looking through some lines and just double checking the stuff. Apart from that, I would spend time in the evening sometime if it was unclear what I was going to play the next day. Basically, I did not do too much, during the match, apart from playing the games. Q: What was the thought behind not revealing the identity of your ‘seconds’ even after the match? Was it your decision or a collective one? A: It’s mainly my decision. That’s the way I’ve understood it. It’s nice that I am going to play another World championship match (in 2014). It doesn’t mean that I’m not very grateful for their hard-work. They have done a wonderful job. I think, it is nice for the future matches not to reveal too much. Q: You once said the format that allows the champion to play only against the challenger was not a fair one. What would you say now? A: I thought about it. I’ll need some time to enjoy the title and then think what I am going to do next. 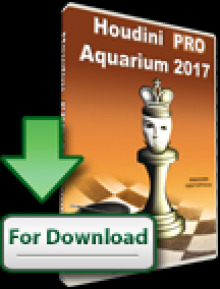 Q: Considering your style of play, much unlike your great predecessors, do you consider yourself some kind of a ‘revolutionary’ in chess in this era? A: Yes, may be a little bit. 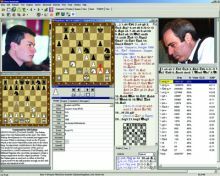 But I think, it’s also been the trend in recent times that people are trying to gain some playable positions from the opening (phase) rather than (looking for) too much of an advantage. Obviously, I play the middle game and endgame better than most people so I can afford to take such an approach. Q: In the end, knowing the respect and admiration you share with Anand, what would be your advice to him, if asked? A: I don’t know what I would be telling him. Difficult to give people advice. My only advice to Anand will be to have some rest. Take some time to figure things out and then decide what he wants. If he decides to come back, it’s wonderful. If he doesn’t, he has every reason to be very happy with what he’s got.